Besides two grants (one from the Netherlands America Foundation in New York) to help me cover the expenses of my traveling to the US and Israel in 2011, this project has been funded by me, by devoting my time and effort to it. Although many have contributed their precious time to the building of the website, the costs of hosting and certain third party involvement cannot be avoided. So we welcome every contribution, however small, that visitors are willing to make to help us maintain and improve this site. Simply click on the "Donate" button here at the left and enter the amount you would like to donate. 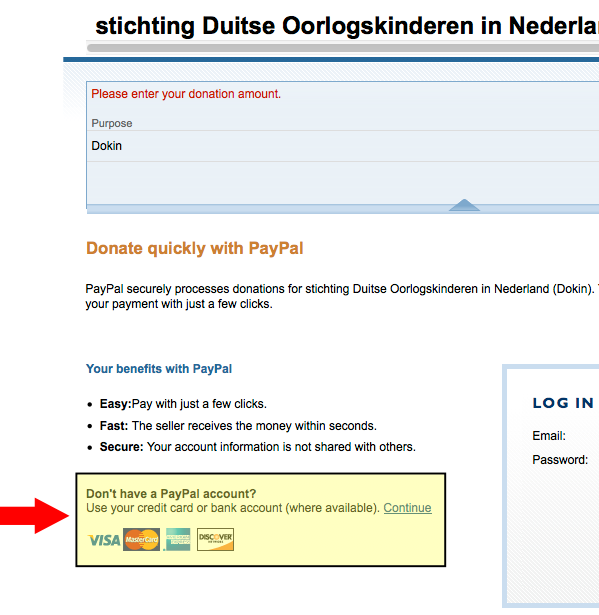 You can still make a donation without having a Paypal account. Simply click on the Donate link shown here at the left to pay with a credit card. Finally, if you prefer to directly deposit a donation to the DOKIN bank account, please contact me and I will send you the bank account details. STEP 1: Click on the "Donate" Button above. STEP 2: Enter amount you would like to donate. STEP 3: Finalize payment with a credit card or paypal account. Please note - you do not need to have a Paypal account to make a donation.